In his closing essay this week Bill Moyers talks about Binghamton, New York's Mayor Matt Ryan and his effort to make manifest the costs of war to his town and its citizens. The mayor has installed a "cost of war" clock that keeps a running tab of how much in tax dollars Binghamton citizens collectively and individually have contributed to the war effort. You can see how much your community has spent by using Costofwar.com, which keeps a running tab. And, you can see what those dollars might have paid for by using The National Priorities Project's "Trade Offs" calculator. ANDREW BACEVICH: "it is the longest war in American history. And it is a war for which there is no end in sight. And to my mind, it is a war that is utterly devoid of strategic purpose. And the fact that that gets so little attention from our political leaders, from the press or from our fellow citizens, I think is simply appalling, especially when you consider the amount of money we're spending over there and the lives that are being lost whether American or Afghan." BILL MOYERS: Hardly had we finished talking about the rising anger over Afghan civilians killed by American and allied troops then news came of more death. American troops opened fire on a passenger bus near Kandahar. They thought the bus threatened a military convoy. At least five Afghan civilians were killed and 18 wounded. Soon a loud and angry crowd was demonstrating against the United States, followed by a suicide bombing at the Kandahar office of Afghan intelligence, killing four officials and another five civilians. All of this as General David Petreus, commander of our forces in the Middle East and Central Asia, told a Washington audience that the continued loss of innocent civilian lives undermines everything we're trying to do in Afghanistan. And all of this as congress prepares to vote on spending another 33 billion dollars on that faraway war. Mayor Matt Ryan Of Binghamton, New York, can't take it anymore. He calculates that by September 30th of this year the citizens of Binghamton will have paid 138 million dollars toward the occupation of Iraq and Afghanistan  and more if congress passes the Obama request for supplemental funds. Binghamton is a small city of 47,000 people with an annual budget of 81 million dollars. Facing a budget deficit, the mayor has to raise taxes or cut jobs and services. He says he is sick and tired of watching people in town "squabble over crumbs" while sending all that money to foreign wars. Next week, he will become the first mayor in the country to install on city hall a large digital clock adding up minute-by-minute how much the people of Binghamton are paying for those two wars. You can find out more about the story and voice your opinion at our Web site here at pbs.org. Historian, international relations expert and former US Army Colonel Andrew J. Bacevich returns to the JOURNAL to discuss America's long war in Afghanistan. (April 9, 2010) Also, watch a web exclusive, extended interview with Andrew Bacevich. The official Web site of Binghamton details the project which includes the installation of a cost of war clock on city hall. "I am here today to tell you that I am sick and tired of telling the three departments that comprise 90% of our City budget  police, fire and public works  that they have to do with less, and I see no end in sight to this scenario unless we change our national priorities." The National Priorities Project is a not-for-profit advocacy group which focuses on the impacts of federal tax and spending policies at the community level. 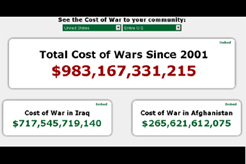 The group's Web site has several interactive features that propose alternatives to federal defense spending and keeps a constant tally of Iraq and Afghanistan war costs. View the JOURNAL's complete coverage of the financial crisis. Bill Moyers on one mayor's efforts to make the cost of Afghanistan and Iraq manifest in his town of Binghamton, New York.